Worldwide Ireland is known for its exceptional hunting horses and the demand for quality Irish Hunters is stronger than ever. The natural rugged landscape, ditches and stone walls established Ireland in having some of the best hunting ground in the world along with the best of Hunters. Hunting in Ireland is a tradition that goes back to ancient times which firmly places the TIH Hunter as a much sought after and coveted mount. The quality TIH Hunters reputation to this day stands proud as the breed of choice for this pursuit in the field and show ring. The TIH Hunter has bravery, balance, jump, stamina, temperament and gallop making them the ideal choice as a hunting partner. The Traditional Irish Working Hunter is renowned for intelligence, power and movement. The TIH Working Hunter has good jumping ability, good conformation and temperament and is judged accordingly. The TIH Working Hunter is a powerful horse, keen and careful, stylish and obedient. The TIH Show Hunter can be divided into three sections lightweight, middleweight and heavyweight. The Show season in Ireland and the UK is rich in the heritage of the classic Irish horse. They are bred and produced to be quality animals with substance, excellent conformation and movement so that they can carry adults at a full gallop across open countryside. The TIH Show Hunter is sure-footed, clean limbed with an open and steady gallop, is forward going and well mannered. A magnificent horse with a rich history and unique bloodlines. The Traditional Irish Horse was the breed that represented Ireland during the “Golden Age” of Irish showjumping (1920-1980). The Traditional Irish Showjumper, through its international exploits placed Ireland on the global map as the Land of The Horse. Centuries of selective breeding of the famous Irish Draught bloodlines with Thoroughbred and Connemara produces a truly unique and exceptional equine athlete with bravery, stamina and athleticism that excels and competes at international levels. The Traditional Irish Horse jumps with exceptional technique and bravery along with sufficient scope. As a horse, they mature more slowly but with the advantage of improvement which leads to longevity within their sporting careers. Famous Irish Show jumpers have lit up arenas throughout the decades and Traditional Irish Horses continue to capture their audience's hearts whilst winning at the highest level. In showjumping, Traditional Irish Horses such as Boomerang, Ambassador, Cruising and more recently, Flexible have left a lasting legacy which is being continued by Ardcolum Duke and Hallowberry Cruz. See our Famous Horses page to learn more about our greatest TIH showjumpers. 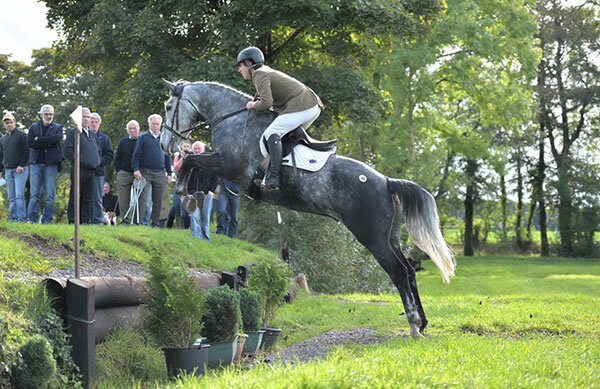 "The Traditional Irish Eventer is a horse worth seeking out. Event riders and buyers all over the world confirm what we in Ireland know so well, the Traditional Irish Eventer is not only genetic gold but eventing gold". The Traditional Irish Eventer is sought out by international buyers who seek the traditional Irish bloodlines which have shaped, dominated and excelled in the sport of eventing. The TIH contribution to the sport of eventing is immense. Ireland's reputation as a world leading producer of top eventers was built on the achievements of the TIH eventer throughout the 20th century. The TIH eventers unique characteristics of stamina, courage, athleticism, longevity and heart allows them to perform at the very highest levels over long careers. Their achievements have been a huge factor in the success of the Irish Sport Horse (ISH) studbook which has topped the world Eventing Rankings for 22 of the last 24 years. In 2012 Mr Medicott (ISH)(TIH) took the number one position in the individual event horse rankings and in the same year was awarded the title United States Eventing Association (USEA) Horse of the Year. In 2012 upon retirement Lenamore ISH(TIH) was the highest British Eventing point earner. Other leading eventers include High Kingdom ridden by Zara Phillips (GBR), Bay My Hero ridden by William Fox-Pitt (GBR) and Kilronan to name but a few. In the USA Eventing Hall of fame, McKinlaigh (ISH)(TIH) has most recently been inducted. This is a prestigious recognition of which only 11 horses in total are honoured, 8 of which are Traditional Irish Horses. With a reputation for heart, stamina and courage the TIH Eventer has taken first place at Rolex three times since it became a CCI4* event in Kentucky. Learn more about our best TIH eventers on our Famous Horses page. The Traditional Irish Horse (TIH) is loved worldwide for its wonderful temperament, trainability and rideabillty. A horse ridden for pleasure or competition the versatility that the Traditional Irish Horse offers is vast. The TIH ensures that their rider can compete at various levels and be multi disciplined. One of their unique characteristics is known in the equine community as having a fifth leg, meaning the Irish Horse always looks out for their rider and can get you safely out of tricky situations. The TIH champions all that could be expected from many horses in one. From a quiet hack, to a hunter trial, from jumping 1.10m tracks to a one day event, a dressage test to a gallop across open country. The Traditional Irish horse can do it all and that's why this horse is so unique and unrivalled.